Once considered little more than nuisances to progress, marshes across the United States have been filled in and paved over to make room for important projects, such as JFK International Airport in Queens or, say, the city of Miami. Developers sought and often received permission to fill in marshes so long as they created a wetland elsewhere, regardless of whether the biodiversity would find the new site. But over the years, scientists, public officials, nonprofit leaders, and policy-makers came to look differently at marshes. A collective new consensus emerged that these places in between land and water were important to preserve. Marshes help attenuate flooding. They are habitat for various birds, plants, and waterfowl. They are being recognized as an important defense against rising seas from a warming climate. 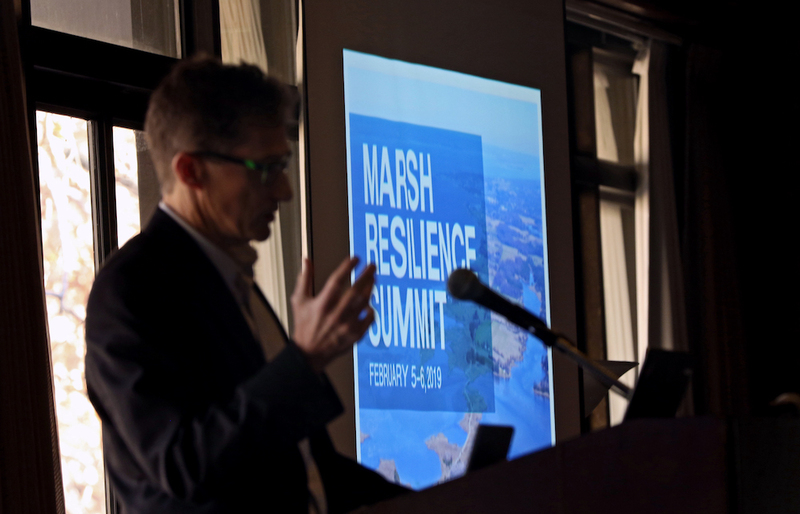 Recognizing this sea change, the Chesapeake Bay Sentinel Site Cooperative organized the first-ever Chesapeake Bay Marsh Summit, held earlier this month in Williamsburg, Va. The event, which Maryland Sea Grant helped organize along with many partners in both Maryland and Virginia, brought together the various constituencies that regulate, protect, and preserve marshes, as well as the agencies that permit development near them. More than 200 people attended. Presentations came from scientists and policy experts at the U.S. Army Corps of Engineers, The Nature Conservancy, the Virginia Institute of Marine Science, and the University of Maryland’s Center for Environmental Science. Maryland Department of the Environment Secretary Ben Grumbles, who has been working on no-net-loss policies on wetlands for 40 years, welcomed the crowd. He said it was gratifying to see different constituents for marshes coming together, despite what he called “strong headwinds” at the federal level for wetland and marsh protections. Grumbles said he was particularly excited about marshes’ abilities to keep carbon out of the atmosphere, a phenomenon known as blue carbon. Rep. Rob Wittman, who represents the First District of Virginia and spent his career working in seafood safety and wetlands delineation, stayed at the summit for more than an hour — taking questions on everything from the Trump administration’s wetland policies to the government shutdown. After his address, he said that, as a Republican in Congress, he is in a “very, very small group” of fellow party members who are focused on protecting wetlands. But, he added, “that doesn’t change my passion for the issue.” Marshes, he hopes, are one of the places where a divided political world can find agreement. Keeping them intact, he said, means less investment in structures like rip-rap, and less flooding in communities. Keryn Gedan from George Washington University and Kate Tully of the University of Maryland explained the issue of saltwater intrusion into farms. Anthropologists Christie Miller Hesed and Elizabeth Van Dolah urged the group not to forget underserved communities that might not have governmental structures to help; places like Smithville, a community on the Shore that is in danger of losing its cemetery and church because a marsh is coming closer. Maryland Sea Grant also showed our film about the issue, Smithville, at the summit. In the coming months, the partners will synthesize what they’ve learned and determine the best science and policy paths forward for marshes in the Chesapeake. But the first step — coming together — was a crucial one, said Taryn Sudol, Chesapeake Bay Sentinel Site Cooperative Coordinator. For more information on marshes, check out Chesapeake Quarterly. For information on the summit or the agenda, look here.